The Minister of Finance Mrs Margaret Mwanakatwe has said that Zambia’s current stock of domestic debt arrears (K12.7 billion as at end-December 2017) has adversely affected economic activity through elevated non-performing loans and subsequently contributed to reduce private sector financing. Speaking about the action taken by the Government to address fiscal and debt challenges in Zambia, the Finance said that Government directed all Ministries to concentrate arrears dismantling to areas that will significantly reduce non-performing loans and release liquidity to the private sector. The Minister further said that the Zambia Revenue Authority(ZRA) has also be directed to come-up with profiles to liquidate current and non-contentious VAT claims. Mrs Mwanakatwe also said that debt contraction is guided mainly by the Loans and Guarantees (Authorization) Act Cap 366 of the Laws of Zambia. Cap 366 vests powers of debt contraction in the Minister of Finance. In this respect, other than the Minister of Finance, NO ONE HAS THE LEGAL POWERS TO CONTRACT LOANS and that the Ministry of Finance is expected to enforce commitment controls to curb accumulation of new arrears. Further, under cap 349, the Minister of Finance is a corporate body, being an office that can be sued and thus on which loan obligations enforcement can be carried out. Meanwhile, the Zambia Government and World Bank yesterday conferred to exchange notes on preparations for the 18th International Development Association [IDA] High-Level Mid-Term Review Meeting which will be hosted by the country in the tourist resort town of LIVINGSTONE, from 13th to 15th November, 2018. The selection of Zambia as host for the meeting was announced in April, 2018, in Washington DC, United States of America, by World Bank Vice President AXEL VAN TROTSENBURG during an IDA 18 implementation update that was held on the sidelines of the IMF/World Bank Annual Meetings. MINISTER OF FINANCE MARGARET MWANAKATWE has reiterated the Zambian Governments gratitude to the World Bank for the opportunity to host the high-level event, which will provide the nation with the prospect of showcasing the long history of IDA’s work in the country. WORLD BANK COUNTRY MANAGER INA MARIE RUTHENBERG took the opportunity to commend the Zambian Government for taking steps to consolidate fiscal prudence. 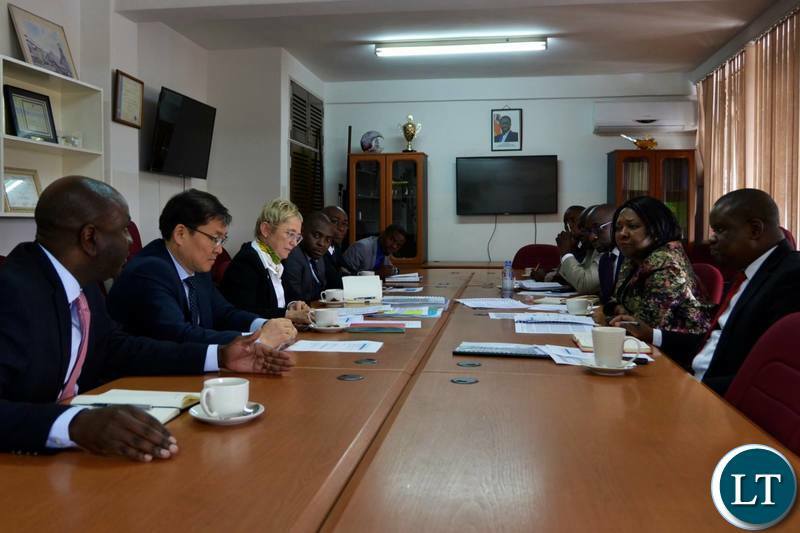 And an additional compliment was expressed by JEAN-CLAUDE TCHATCHOUANG, Africa Group 2 Constituency Alternate Executive Director at the World Bank Group who said, April 2018, that Zambia deserved to host the High-Level event because of her good credentials in implementing World Bank programmes. It’s Alexander Chikwanda to blame for this. He made Zambia get expensive money from foreign bond markets instead of cheaper money from the World Bank. The reason is simple. He did not want to be subject to World Bank discipline in funds disbursement and supplier selection. Yes, many bank loans aren’t performing and Maggie Mwanakatwe acknowledges it. Chikwanda-created financial black hole is causing real damage but the creator will be the last person to acknowledge it. Instead of crying my beloved country just go after FQM and let them pay that US7.9billion so that our debts reduce to half you morons. Why should we keep moving with a begging bow all the time when God has endowed us with natural resources? Corruption, thievery, lack of empathy to the poor masses and sheer greed. More than 50 years of independence and nothing to show for it. There was genocide in Rwanda, wars but look at that country today, we should be ashamed of ourselves for having put incompetent leaders in power and now we are paying the price, DUNUNA REVERSE RELOADED. Bamwine: So God endowed Zambia with natural resources? Why is the process of trying to exploit minerals so polluting to the environment? Did God intend it that way? So many innocent creatures lose their lives when pollution affects them. Did God want it that way? Serious questions for your reflection. @ 2.1 Chanchima -What is exactly your point? Mwakale: This is not a church where statements like “God endowed Zambia with minerals etc” go un-inquired into. It is a debating/discussion site where dissenting views should be expected. The questions are clear. Proffer some answers and I will be waiting. Enlist help from those who disagree with me. Abayello: I have no problem you disagreeing with me. Let’s wait for 2022 and I hope we are both alive. Many people including the Catholic Church warned Chikwanda against rapid debt contraction. He ignored those warnings and even went to parliament to increase the debt govt ceiling. Where are we now? 2022 is a mere four years. I will wait. And who contracted this debt. It’s the same PF government.